Over the years we have become dependent on coal and natural gas to make over 70% of the electricity in Wisconsin. The problem is we don’t have any coal or natural gas reserves in Wisconsin, so we send away well over a billion dollars per year to bring these resources in. But the times are changing, and this is good news for Wisconsin. The cost of developing solar power projects has dropped by over 75% in the past decade. 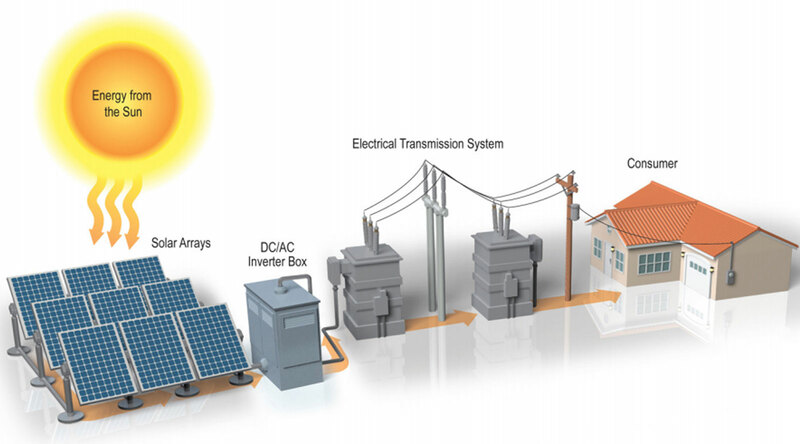 Solar power technology has improved, so that more of the sunlight is directly converted to power. This allows even a seasonal state like Wisconsin to be a viable place for solar energy. 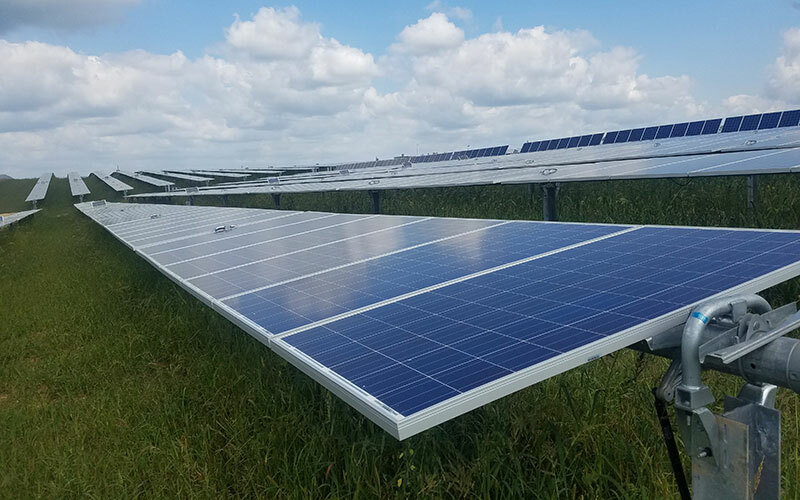 Wisconsin utilities are partnering with companies that want to develop more clean energy at scale, and we support win-win solar development with a voluntary pollinator-friendly standard that will enable bees, birds, and soil to thrive where solar development sprouts up. 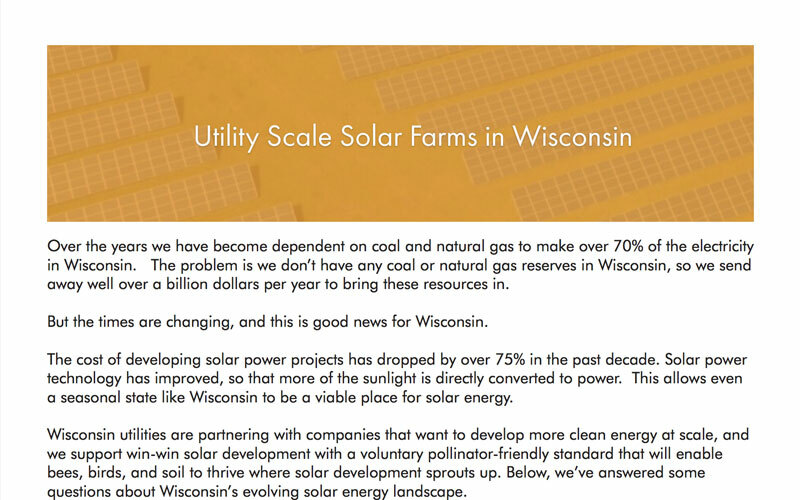 Below, we’ve answered some questions about Wisconsin’s evolving solar energy landscape. “Utility-scale solar,” “large-scale solar,” and “solar farms” are different terms that describe a solar power facility that generates enough electricity to serve many customers, as opposed to a single home or business. These facilities are typically located on open land and near an existing substation or electric transmission infrastructure. How do solar panels and solar farms work? Solar electric panels create electricity directly from sunlight. When sunlight hits the panels, semiconductors inside the solar panels are activated to produce usable electricity. In a solar farm, many individual solar panels are grouped together to produce a lot of electricity. In most cases, panels are mounted on “single-axis tracking systems.” Solar panels are attached to horizontal poles which run north to south. Throughout the day the panels rotate from east to west to follow the sun. The equipment in a solar farm includes solar panels, racking, cables, inverters, transformers, and a power line or substation to deliver the power to the electric transmission grid. Are there any solar farms operating in Wisconsin today? Yes. There are more than 20 solar farms in Wisconsin that are presently generating electricity for utility use. Many of these are in the range of 1-5 megawatts of solar capacity. A one megawatt solar farm produces enough electricity annually to offset the needs of about 190 average Wisconsin homes. Who are the developers of these solar farms? Most solar farms in Wisconsin and around the country are developed by private companies committed to responsibly meeting local energy needs through the advancement of renewable energy. Who uses the energy from these solar developments? Wisconsin does! Thus far, all solar farms built or proposed in Wisconsin are owned by, or sell their electricity to, Wisconsin electric providers. Among the Wisconsin utilities purchasing solar energy and using it to serve their many customers are Dairyland Power Cooperative, Xcel Energy, Alliant Energy, WPPI Energy, River Falls Municipal Utilities, and New Richmond Utilities. Madison Gas & Electric, WPPI Energy and Wisconsin Public Service have publicly stated their intentions to acquire more solar energy from Wisconsin-based large-scale solar projects. Are there new solar farms in the works? There are also numerous smaller solar farm projects in development across Wisconsin. Why is solar energy being pursued as a source of grid power? The most important driver behind the growth of solar is the declining cost of solar power technology and installation. The cost to install solar has declined 75% or more in the last decade. The cost of new large-scale solar generation has dropped to the point where it is cost-competitive today with traditional coal and natural gas power plants. How much land is required for solar farms? A good rule of thumb is five to seven acres of land are used for every megawatt of solar power capacity. A solar developer will seek to contract for additional land to provide more flexibility in laying out the arrays, routing interconnection corridors, and to meet state requirements for alternative siting options. What government agencies are involved in approving these types of projects? All local governments located in a project’s footprint are involved in reviewing zoning for these projects. Permits for the land to be used for large solar energy generation projects are reviewed by local township boards and the county board(s). This is typically accomplished through a Conditional Use Permitting process. 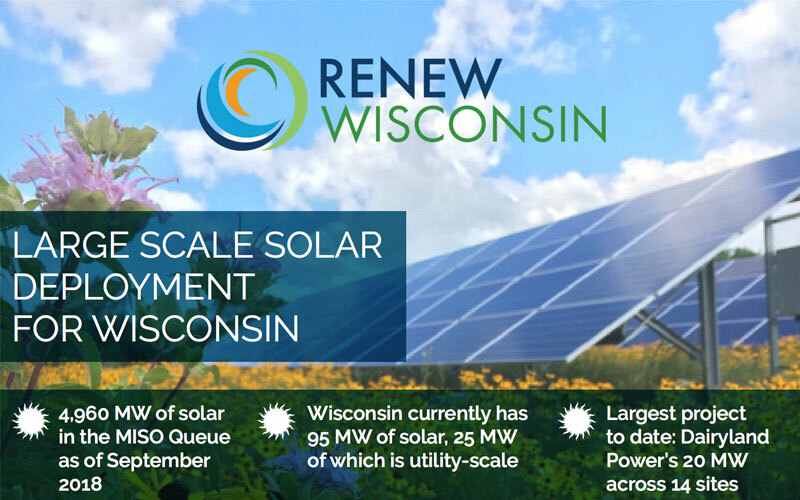 RENEW Wisconsin believes solar farms should remain zoned “agricultural” where applicable, with a conditional use permit to allow for solar energy generation. This is for two reasons. First, to increase the chances that the land will go back into agriculture after the solar project’s lifetime. Second, plantings under the arrays can be designed to support agricultural purposes such as supporting pollinators, rebuilding the soil, and provide similar functions as land in the federal Conservation Reserve Program (CRP). Solar farms sized 100 megawatts and larger also must gain approval from the State of Wisconsin’s Public Service Commission. This process is called a Certificate for Public Convenience and Necessity, or CPCN. There are opportunities for public comment at the township, county, and state levels. These projects are reviewed by many state and local agencies to encourage responsible and low impact development. Electricity usage in Wisconsin has been relatively stable. What need is there for new solar projects? Wisconsin utilities are planning to retire several coal and natural gas plants in the next two to three years and this electricity capacity needs to be replaced. The cost of solar has declined tremendously, making solar projects an economic solution. Utilities estimate that large solar projects will meet their needs for summertime peak power capacity at the lowest cost compared to alternatives such as natural gas or coal power plants. How do solar farms benefit landowners? Solar farms are often placed on privately owned land. Participating landowners voluntarily lease their land to host all or a portion of a solar farm and receive annual lease payments in return. The participating landowners find that the long-term lease payments are financially attractive, often because they can help supplement farm income and provide a hedge against changing commodity prices for corn, soybeans, milk, and cattle. Participating landowners bear no construction or operating expenses for the solar arrays. The project will be decommissioned and the land will be restored at the end of the solar farm’s useful life. How can solar farms benefit local governments? In Wisconsin, owners of solar farms greater than 50 megawatts pay annually into a utility aid fund which is shared with the local governments where the solar farm is located. Under the revenue sharing formula currently in place, a qualifying solar farm will contribute $2,333 per megawatt (MW) per year to the county and $1,667 per MW to the township(s) hosting the project, for a total of $4,000 per MW per year. For example, a 100 MW solar farm would provide approximately $233,000 annually to the host county and approximately $167,000 annually to the host township(s). Over the first 25 years of such a project’s operating life, over $10 million would be provided to the local governments where the project is located. For projects 50 megawatts are larger, the private land leased to a solar farm becomes exempt from local property taxes. Although this land will no longer pay property taxes, the net gain to the local governments is estimated to be at least 10 times higher than the lost property taxes. For example, a 300 megawatt project being pursued in Wisconsin has found that the property taxes currently paid to local governments amount to less than $100,000 for the land that would be transferred into a solar lease. In contrast, $1,200,000 will be paid annually to the local governments if the solar project is approved. How can solar farms benefit community residents? With a fresh flow of revenue generated from solar farms, local governments will have the option of either allocating those dollars toward essential public services, reducing property tax rates broadly, or both. A few Wisconsin jurisdictions that host renewable energy projects have used shared revenues to supplement their road maintenance and repair budgets, while others have augmented police and fire service through vehicle and equipment purchases. Utility local aid revenue has no strings attached to it, thereby enabling local elected officials to use their discretion to decide how the revenue can best serve their communities. Can hosting solar panels help agricultural land? Yes. The land that supports solar arrays can be revegetated with a range of low-lying, deep-rooted plants, grasses, and flowers that can rebuild the soil. In addition, these plantings can support honey bees, butterflies, hummingbirds, and other pollinators whose populations are facing threats. Is the conversion of agricultural land to solar generation permanent? No. Modern large-scale solar installations use steel posts that are driven or screwed into the ground, but do not use concrete pilings. This means that the land can very easily be converted back to farmland after the life of the solar project. The life of the project is estimated to be 25-40 years. Upon the conclusion of the lease and the decommissioning of the project, the landowner is able to resume traditional agricultural operations on the land. Notwithstanding the growth of farm-based solar generation across the United States, the total amount of agricultural land being used for solar energy is small compared with the permanent conversion of agricultural land to residential housing and commercial development. In fact, Wisconsin could produce about 50% of our annual electricity needs through the use of solar panels on only 150,000 acres of land. For comparison, as of 2016 the total harvested land in Wisconsin was approximately 8,857,500 acres. Can solar panels withstand strong winds? Testing by solar manufacturers includes a certification that the panels can withstand winds of up to 140 miles-per-hour, the equivalent of a Category 4 hurricane. In real-world performance, there are reports that nearly all solar panels located in areas hit by Superstorm Sandy (2012), Hurricane Michael (2016), and Hurricane Irma (2017), survived the high winds with few panels damaged beyond functionality. Any other losses were due to the destruction of an entire roof or structure. Are solar panels a safe technology? Yes. Solar panels are safe to touch, attach to your home, and install in your neighborhood or town. Panels are primarily made of glass, aluminum, copper, and other common materials. Solar projects also utilize steel racks to position panels, electrical cable and inverters and electric transformers to deliver power to the grid. All of this equipment is safe and contains the same materials that are found in household appliances. There are trace amounts of chemicals in solar panels that enable them to produce electricity. These compounds are completely sealed within the glass and coatings of the panels. After their useful life, solar panels and equipment are easy to disassemble and recycle. Solar facilities are constantly monitored, and the owners have a business interest in keeping them well-maintained and operating properly. Solar plants are designed to withstand severe weather, and panels are built to last for up to 40 years. If solar panels are damaged, they can be quickly replaced with new ones. What is it like living next to a solar farm? Solar farms are quiet neighbors. They are a very low-impact development within communities. Unlike using natural gas or coal to generate power, they do not combust anything and thus have no pollution. They do not create any odors or output any chemicals. Solar farms use no water for their operation. This is also in stark contrast to using coal or natural gas to make electricity. The only audible noise is from cooling fans within equipment (inverters and transformers) that move the electric power to the grid, and those only operate when the sun is shining and power is being produced. After the sun goes down, there is no audible noise from the solar equipment. Native vegetation under the arrays can improve water quality and reduce runoff in the area. Will there be stray voltage from a solar farm? No. The collection and transmission lines used in these modern solar farm effectively prevent stray voltage. These lines are significantly different than what might be seen in local distribution systems or low-voltage wiring in sheds, barns, and dairy facilities. Will glare from the solar panels be a problem? No, this is actually a common misconception about solar PV modules. Solar modules are made to absorb sunlight, not to reflect it. Solar modules are flat, have a relatively smooth surface, and are covered with anti-reflective coatings. Modern PV modules reflect as little as two percent of incoming sunlight, about the same as water and less than soil or even wood shingles. What happens if there is snow on the solar panels? In larger solar farms, the solar panels rotate throughout the day. When they are tilted, snow will slide off on its own. If some portion of the panels are covered in snow, the remaining portion can still generate power and, in doing so, will generate some heat that will encourage melting of the rest of the snow. How do solar panels produce power when it’s not sunny? At night the solar panels go into standby mode and do not produce any energy. However, even on cloudy days the panels are producing power. Can some of the solar power be stored in batteries to use at night? How many jobs will be created to construct an operate a solar farm? As an example, a 300 MW project might create 500 new local jobs while in construction, and 5 operations and maintenance jobs once it is operational. Do solar farms protect the wildlife in the area? Solar PV projects by themselves do not present a significant risk to wildlife. When native meadow ground cover is used, the project will create new habitat for pollinating insects and birds, as well as improve water quality for local aquatic species. Projects are also required to install fencing, which keeps wildlife out and reduces risk to animals in the area. Are the solar panels or any of the other components made in Wisconsin? Although we do not have any solar panel manufacturing in Wisconsin, many of the parts needed to build and operate solar farms are indeed made in Wisconsin. See a list of products manufactured in Wisconsin for large solar projects. 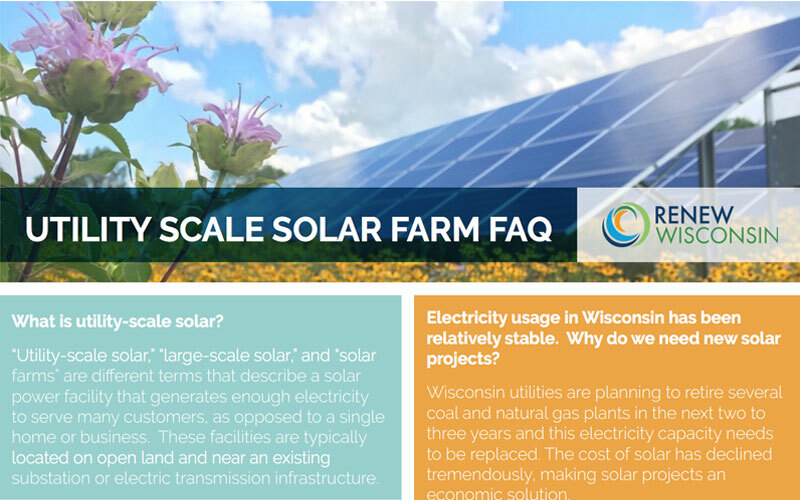 Want to talk about solar farms in Wisconsin?